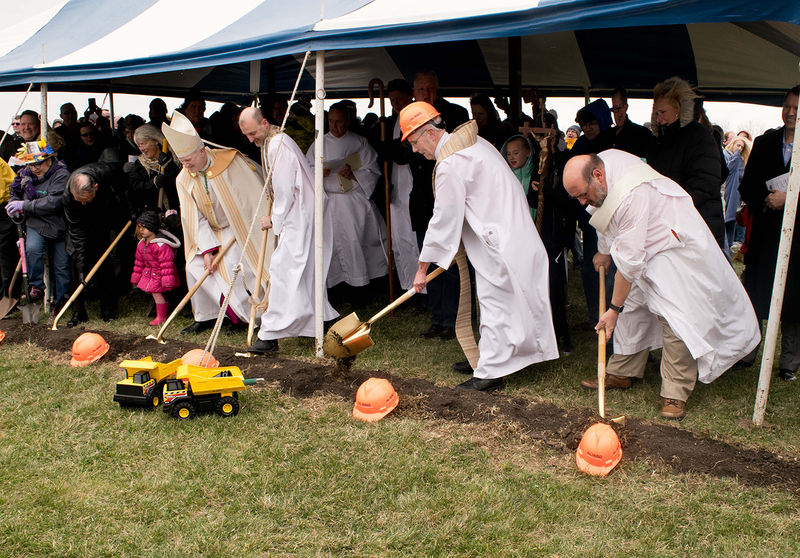 On Sunday afternoon, April 15, the long awaited groundbreaking for the new St. James Church in Liberty was realized. More than 400 parishioners and others gathered as Bishop Johnston, Fr. Mike Roach, Fr. Timothy Armbruster, and Deacon Chuck Koesterer “turned the dirt” at the site of the new church on the knoll south of the school. The celebration, which began in the church due to the inclement weather, included recognition of former St. James C.PP.S. pastors Fr. Joe Miller, Fr. Ron Will, and Fr. Tom Albers, a short biography of the life of St. James, and a brief history of the parish from 1847 to the present. This was followed by a procession to the new church site for Bishop Johnston’s blessing and the actual groundbreaking, complete with gold shovels. A reception in the parish hall followed.